WARSAW, Poland -- The Ukrainian state-owned defense company Ukroboronprom has built the country’s first military unmanned aerial vehicle (UAV) to bolster Ukraine’s combat against Russia-backed insurgents in the country’s east. 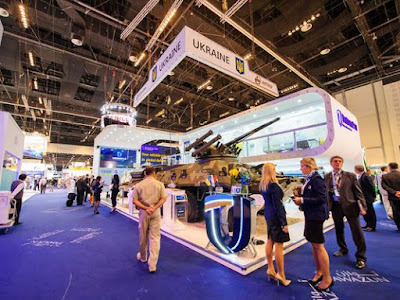 The Ukroboronprom booth is seen at the International Defence Exhibition and Con. The first batch of three drones was supplied to the Ukrainian Armed Forces, Ukrobonoprom said in a statement. The BpAK-MP-1 UAV was built by the firm's subsidiary Meridian in cooperation with a research team from the Kiev Technical University. "The path from the design phase to production was just one year," the statement said. Yuriy Paschenko, the deputy director general of Ukroboronprom, said that the tactical version of the new drone, which will be fitted with combat capabilities, will made in late 2016 and supplied to the Ukrainian Armed Forces in the first quarter of 2017. The amount of the project was not disclosed. Ukroboronprom is headquartered in Kiev, Ukraine. The state-owned group consists of nearly 130 companies which are specialized in manufacturing and export sales of aircraft, missiles, armored vehicles, ships, munitions, radio communication and other types of arms and military equipment. The Ukrainian group was set up in 2010 with the aim of consolidating the country’s fragmented defense industry.